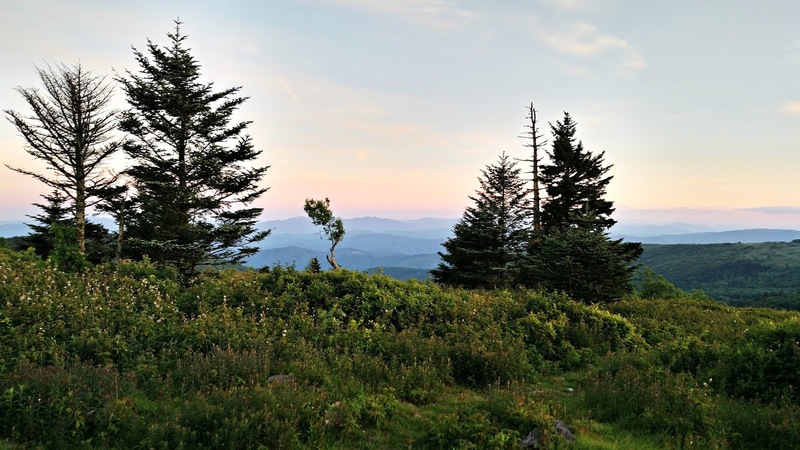 After a long day of uphill hiking (slightly over 6 miles), the shelter at Thomas Knob was fairly crowded for the night, and we had packed tents anyhow, so we looked for a quiet spot to set up camp. The view from our campsite was just gorgeous. Once the tents were up, we set to work boiling water to make some Mountain House backpacker meals. I got a great deal at a yard sale on these - $1.50 a piece, and they weren't expired! For freeze dried food, Mountain House really does have good flavor. I didn't know if the boys would like them or not, but it turns out they loved them. They sampled spaghetti and meatballs, beef stroganoff, and Cajun beans and rice. It was cold on top of the mountain, so they had to bundle up to eat dinner. It got down to around 39* that night. Now, as promised, here is what makes the Grayson Highlands area different from other regions of the Appalachian Trail - wild ponies! We saw them many times during our hike. Here's a young one that came into a clearing where we were taking a break. 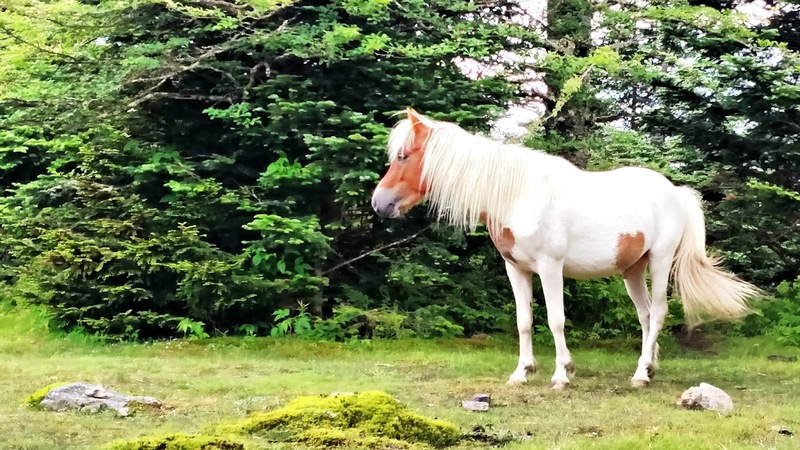 These wild ponies are a little too friendly because hikers keep feeding them granola bars. When they hear plastic rustling, they come too close and even act aggressive. Granola bars and other sugary treats are not healthy for horses and ponies anyhow, so if you go to the region please don't feed the wild ponies! Just enjoy them from a safe distance and treat them as part of nature. Our final stop for lunch on the second day - one of the typical Appalachian Trail shelters. This was about 1.5 miles from our car. I think this is going to be one Father's Day that will be hard to top! 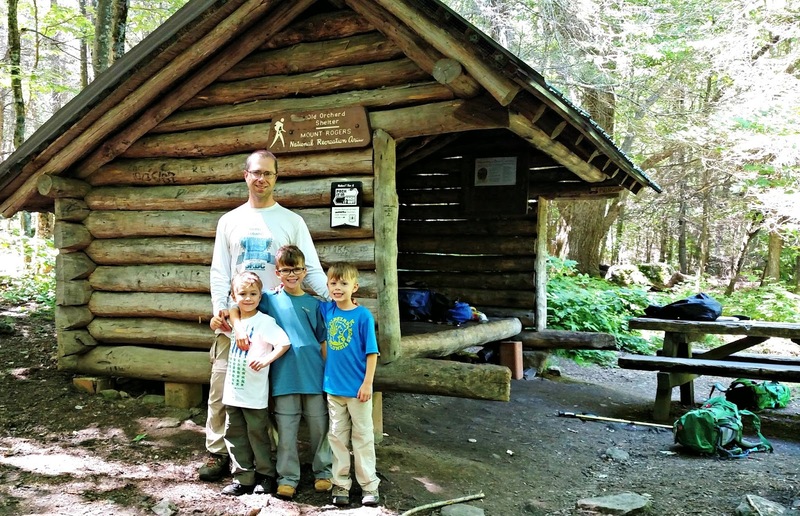 Be sure to come back on Friday to read about all our trail bloopers - they are sure to make you laugh! Beautiful! That is my favorite place to go. The only drawback is its too crowded nowadays. I think I'm trying Whitetop, the adjoining mountain next time. If you weren't so far away in another land I would loved to have tagged along with you all as well! What a fun adventure! I remember when my parents packed us all up for a 2 week backpacking trip in the Wind Rivers. (Wyoming. High back country. Glacier lakes etc.) It was amazing and so rich with memories, but I think about it now and it exhausts me. Poor Mom. We might have to hit that area just to see the wild ponies. So cool! Sweet horses, and what a view! Looks like you're all having a blast! What fun! 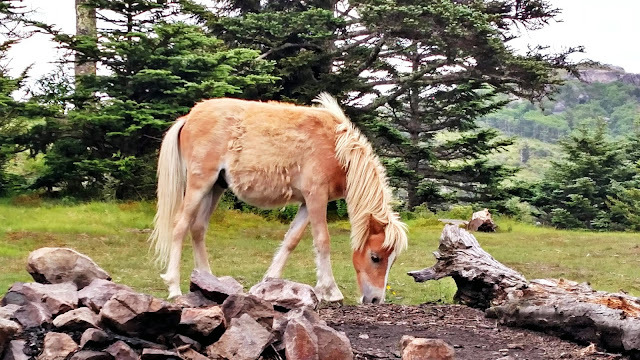 I was wondering if you were on the Appalachian trail...what an interesting place, with the wild ponies! This is just so interesting! 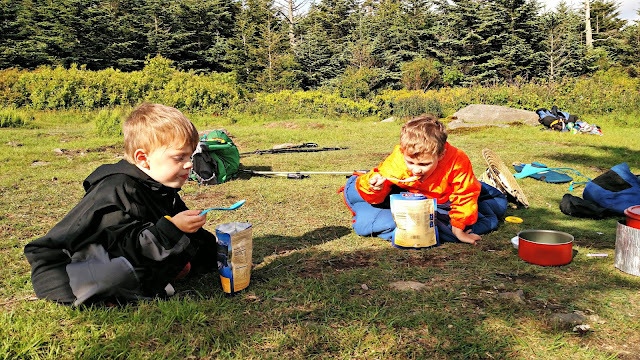 I think my favorite picture is the boys eating the freeze dried food. They must have loved the ponies! The first pony is very pretty. It is good to see Paul today! Man I wish it would get down to 39 here every night!!! I am sooo jealous of your adventure!! I want to come next time! Love the ponies! What a great Father's day for them to remember! Wild ponies, that is so cool !!! Love the horses! Sounds like a great trip!